Can’t you hear J. Edgar’s spiteful, malignant voice in the letter below? 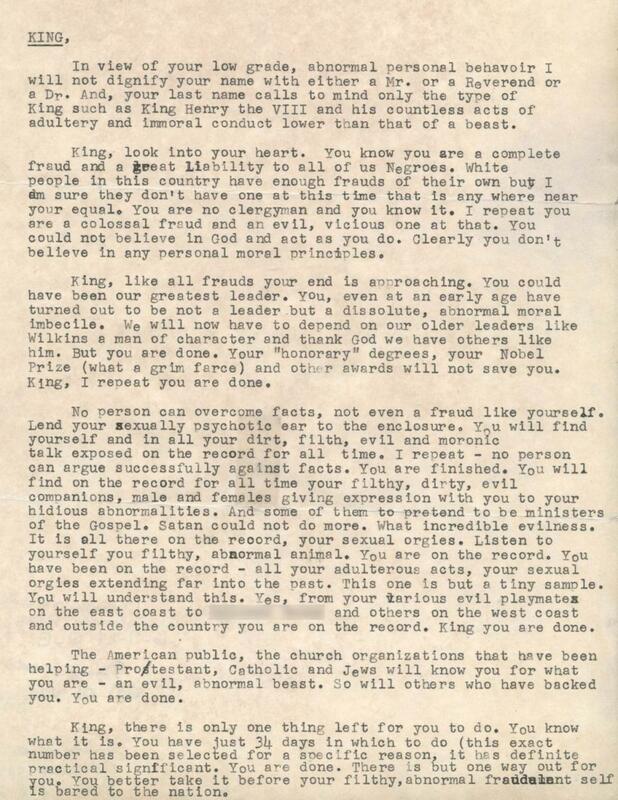 It feels like he typed it at his own typewriter, then handed it to an underling with the instructions, “Make it look like someone else wrote it.” We can’t know exactly what role Hoover took to compose this letter, but we know he hated Martin Luther King. We know Hoover wanted to see King gone. The anonymous letter below, sent in November 1964, was Hoover’s incredibly crude attempt to push King into killing himself. The letter didn’t work. Three and a half years later, in 1968, King’s enemies at the Department of Justice took more direct action. At least history gives us more justice than Washington does. Just over fifty years after Hoover’s FBI delivered that letter, we celebrate Martin Luther King Day to honor a courageous, kind, and committed leader. Hoover, meanwhile, lies in his coffin, uncelebrated and rightly maligned. He took such care to polish up the FBI’s image, along with his own. He wanted everyone to think he and his G-men would come to the rescue whenever some evil doer dared to threaten public safety. He regarded King as one of those threats. Instead, Hoover threatened all of us with his power, secrecy, and malevolent machinations. Over time, he became the nation’s most potent threat to public safety. He built an agency, like an incubated nightmare in the police state we now witness, that would be laughable if it weren’t so criminal. He spent his time spying on King, nurturing hate for a good man. He wanted to get the goods on King, so he could write letters like the one above! Now one man is a villain, and the other is a hero. When we honor our heroes, we become like them. Blessed Martin Luther King Day. The series of short videos at the top of this biographical website is excellent.